Explore the Dominican Republic on a 5.5-hour shore excursion from Amber Cove that’s tailored to your ship’s schedule. 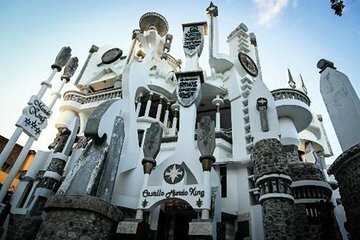 Visit the Castillo Mundo King to see art and sculptures in a remarkable setting, eat a barbecue lunch on the beach and sip rum cocktails. This 5.5-hour Amber Cove shore excursion includes pickup and drop-off at the cruise port, all activities, lunch, and drinks. Meet a guide outside the Amber Cove cruise terminal at a time that’s convenient for your schedule, then board an air-conditioned vehicle for the one-hour trip to Castillo Mundo King. Bring your camera to capture this unique museum of Haitian and Caribbean art, housed in a surreal five-story building. Your next stop is Sousa Beach, just five minutes downhill from Castillo Mundo King. You’ll dine on a Southern-style barbecue lunch of chicken or ribs at Big D’s Barbeque (a grilled vegetarian plate is also available), with plenty of rum drinks to enjoy alongside. Meet Big D himelf—he was once the chef to the New York Knicks—then head to the beach to enjoy the Caribbean sunshine. The remainder of the tour is all about relaxation, as you swim, stretch out on a beach lounger, or browse the shops. This 5.5-hour tour concludes with drop-off at Amber Cove.